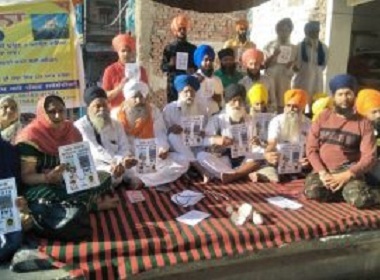 TARN TARAN SAHIB, Punjab—Around 8-10 armed supporters of the Kaar Sewa sect head Baba Jagtar Singh today threatened Sikh leader S. Karam Singh Bhoian beneath the demolished Darshani Deodi of Gurdwara Sri Tarn Taran Sahib. Equipped with sharp edged weapons, all these supporters of Baba Jagtar Singh abused and threatened Bhoian of serious consequences if he doesn’t quit his strike. It is pertinent to note here that on one side Baba Jagtar Singh is facing immense Sikh wrath for demolishing the historic Darshani Deodi of Gurdwara Sri Tarn Taran Sahib and on the other hand Karam Singh Bhoian’s peaceful sit-in-strike has closed all the channels for Baba Jagtar Singh as well as for the SGPC to get rid of this issue. Pritpal Singh Amritsar, who is accompanying Karam Singh Bhoian from the day one of his sit-in-strike. Sharing the development with Sikh24, SAD (Amritsar) activist S. Pritpal Singh informed that around 8-10 supporters of Baba Jagtar Singh today started abusing and threatening them for no reason. He added that they didn’t pay any attention to them as their sole motive was to launch an attack by instigating them. “We have lodged a complaint in the Tarn Taran’s city police station in this concern,” he added. Meanwhile, the mass support to Karam Singh Bhoian’s struggle is intensifying day by day. On the seventh day of his strike today, a group of Nawnshahr based Sikhs headed Jaswinder Singh Kahma and Dr. Kashmir Singh extended support to Bhoian’s struggle by paying a special visit to him. Beside it, a group of Sikhs headed by S. Vakeel Singh Brar from Mandi Dabwali (Haryana) also extended support to Karam Singh Bhoian’s struggle.